This was my tire after meeting with Charlene. I noticed a whump whump whump. I pulled over to take a look only about 5 minutes drive from home. Then I did what a sensible woman does at 10:15pm on a Friday night when faced with parking in the curbside zone of a dark-ish neighborhood- called AAA. Tomorrow morning will be early as I now need to hit the tire shop before I go to Yoga. 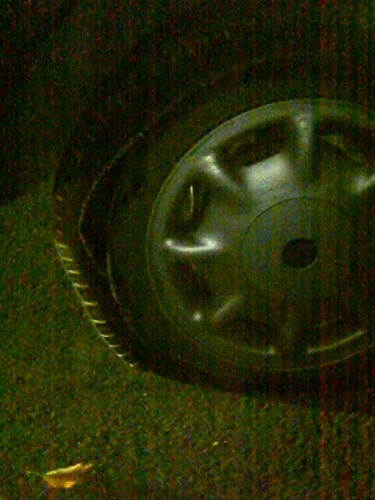 And find out what caused the sidewall to separate... Good thing this didn't happen on the Freeway. Or on my way to meet Char. Maybe it did and I was just oblivious?! Hopefully, this doesn't have anything to do with how I inflated the tire a week ago (but it was the other side that was really low). BTW, this was a decent photo at night for a phonecam with a completely dark screen which was lit with the led "disco light" flash on my phone. Couldn't see a thing when I was taking the photo. 2. They swapped the old front tires to the rear and put the new tires in the front, since my car is a front wheel drive. Also credited me with a bit of warranty money which made the new tires a bit more affordable. They did say I could do only one tire, but the other back tire could use changing, too and it is recommended that I change out a pair at a time. All of it mostly painless. OH MY GOSH!!! YOU DIDN'T TELL ME! That's crazy. I've only seen the remains of blown out tires like that on the freeway. Thank goodness it wasn't on the freeway! This page contains a single entry by freecia published on October 7, 2005 11:15 PM. Domain Transfer- Pardon if there's an outage was the previous entry in this blog. Now THAT's Service is the next entry in this blog.